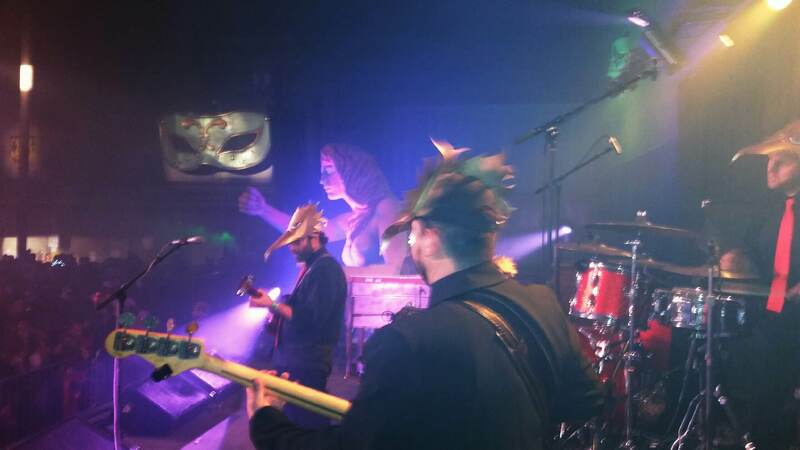 On Tuesday night we played in St. Paul, Minnesota, at a club called Vieux Carre. Vieux Carre is a sit-down dinner club that focuses on the food and culture of New Orleans, as evidenced by the name. The walls of the club are covered with beautiful black and white photos like the one below of Allen Toussaint and Dr. John. Polyrhythmics don’t play very many dinner shows, but I enjoy them because it reminds me of going to Seattle clubs like Jazz Alley and Tula’s, especially when I was younger and imagining what it was like to play on those stages for a quiet audience at tables. As it turns out, a combination of a small group of passionate fans and a large group of strangers visiting town for business made for an unexpected vibe, but everyone had fun and we played well. Next up I’ll talk about Milwaukee, which we played last night. I’m happy Seattle has a station promoting great new music with the in-studio sessions, and I’m recognizing more and more how many really talented musicians there are in town that I don’t know about, which is both sobering and motivating; it keeps me inspired to work hard on my music too. Last month I spent 17 days on the road with Polyrhythmics, having played 13 shows, and on 11 of those shows we shared the stage with the band Ghost Note. Although the road is always thought-provoking and eventful (in addition to a lot of work), it’s the sharing of the stage that’s prompting this post. Ghost Note is co-led by Nate Werth and Robert “Sput” Searight, both musicians I first heard when they were performing with the band Snarky Puppy. They are the center of the group, are both immensely talented, and draw equally talented musicians to that center, surrounding themselves with people that match their level of musicianship and passion for creative music. The tour began with Nate on percussion, Sput on drums, MonoNeon on bass, Vaughn Henry on keyboards, Jonathan Mones on Alto sax, and Sylvester Onyejiaka on Tenor sax. Halfway through the tour, Sylvester and Vaughn left, and the band added Domi on keyboards, Peter Knudsen on guitar, and A.J. Brown on bass (for 2 of the gigs). All from different parts of the country, all immensely talented. It was incredible. -These guys WORK. Like all the time. Whether it’s recording parts for someone from their house, DJ’ing radio shows, travelling for gigs, or making videos and music through their social media platforms, everyone involved in Ghost Note works on music-related projects in a wiiiiide variety of forms. And it’s not limited by geography; they’re involved in collaborations with people across the country. -Even while they travel and connect with people away from home, they’re connected with the scene where they live. Following them on social media, I can see what everyone is doing locally, whether it’s Portland, Miami, Dallas, or New York, among other places (yes, there were members of Ghost Note currently living in each of those places!) And although I’m sure all of the Ghost Note members have occasional issues similar to what I’ve just begun to deal with – in terms of striking a healthy balance between in-town/out-of-town and work/friends and family – it was motivating to talk to and be around musicians that were so professional in terms of networking and personal promotion. -They were all really warm and supportive! They’ve played with some of the greatest and most famous musicians in the world, and there were no egos, just people focused on playing music at the highest level they can, and enjoying it at all times. And that was the case no matter how big or small the venue was; they always brought it and played with full intensity. This is another thought that seems obvious when it’s written down, because everyone says that great musicians do that, but it’s different when you see it in action. I can think of a few very specific situations on this tour where Ghost Note could have played differently or dealt with things in another way, and I watched them put huge amounts of time and energy into the show, their fans, and the venue and staff. I have a lot of other thoughts swirling in my head after this tour and Polyrhythmics’ recent run to New Orleans, but I will end here with these initial thoughts about the Ghost Note run. If you’re so inclined, check out their recent album, Swagism, and stay tuned for more from me! Bayou Maharaja – This doc is about James Booker, a New Orleans pianist and entertainer that was active primarily in the 70’s. Although he made several European tours and played with many of the era’s great musicians, Booker stayed in NOLA for the most part, which is part of why he is still unknown to many people. I first heard about him when I visited New Orleans with Polyrhythmics the first time in 2014, and it’s a shame not only that I had not become familiar with him sooner, but also that he is still so underappreciated. Completely unique, extremely talented, and fascinating in every way. Check out the movie! Our Vinyl Weighs a Ton – Our Vinyl Weighs a Ton tells the story of Stones Throw Records, the LA label started by DJ Peanut Butter Wolf and responsible for supporting music by Madlib, MF Doom, J Dilla, and others. In addition to those artists, I have Stones Throw to thank for turning me on to a few other artists that became important to me for one reason or another, like the Stepkids, Mayer Hawthorne, and James Pants. What interested me the most when watching this movie was how organic the process was in creating the musical scene around the record label; Wolf would actively pursue the music that he thought was cool, regardless of how the bands and musicians related to each other. In this way, there are some Stones Throw albums that, when put next to each other, would seem like they don’t belong on the same record label, and yet at the same time there is something in the sounds of all their records that makes it sound like Stones Throw. Wolf created a sound and a scene by not worrying about style or genre or whether it made sense. Muscle Shoals – Similarly, I enjoyed how Muscle Shoals recounted the creation of the style and sound that would come to represent early music by Aretha Franklin, Wilson Pickett, and Duane Allman. The Muscle Shoals Sound would become famous, and its origin is nothing more than 4 studio musicians and a recording engineer from a small part of Northwestern Alabama making music that sounded good to them. The story of Muscle Shoals, from humble beginnings to more modern music industry struggles and everything in between, was truly inspiring to me. I hope you’re encouraged to watch these films after reading this. You won’t regret it! The Polyrhythmics tour to New Orleans and the Southeast, from Kentucky (or, as some call it, Kenpucky,) to Florida to North Carolina and beyond went relatively smoothly, with many new areas visited from both the band perspective and a personal perspective. I enjoyed the cultures and people in the South so very much, and loved having the opportunity to play music there; once again I felt a real appreciation for professional musicians and bands in the cities to which we traveled. Even before this tour I had a few long drives, so I checked out a book on tape: Possibilities, an autobiography by Herbie Hancock. I really liked it! Herbie goes into detail about how certain musical projects and bands came about, and what the dynamic was like in those groups, as well as how his musical philosophy changed (or stayed the same) throughout his long career. Definitely some interesting perspectives from a guy that has been TCB’ing (Taking Care of Business) for quite a while. I would also recommend, to other aspiring professional musicians in particular, this interview with drummer and producer Jojo Mayer that Adam Gross recommended to me. There were a few observations from Mayer there about where you work and play music versus where you live, the decisions you make regarding your life as a professional musician, and what the music business means to him. Good stuff. I think each time I return home after 2 or more weeks away I engage in the same self-reflection, but once again it’s really hitting me that music is my professional future, both teaching and playing. For a while after college it was in the background of my professional life; something I was doing intermittently when I wasn’t busy working. Then, even when it was in the forefront, I assumed that someday I would have to push it back again. I think I’m getting closer to eliminating that assumption, which feels really good. When David Bowie passed away, I was motivated to listen to more of his music, as I had really only heard his big hits previously. As I have occasionally done with other artists in the past, I decided to start with his early albums and move through them chronologically (I wrote about this approach previously here). Listening to his albums this way definitely taught me some things about the development of songwriting, exploring different sounds and textures in pop music, and how pop music can be inventive and unique. I really missed the boat in not listening to his music earlier. With an upcoming special event that Ben Bloom and the rest of the Polyrhythmics will be putting together in New Orleans for JazzFest, I moved on to do the same focused listening with the discographies of Fela Kuti and the Grateful Dead. I knew a fair amount of Fela’s music, but almost none of the Dead’s music, and once again both experiences were significantly enlightening. What struck me in listening to the Grateful Dead was how interesting the actual composed material was; it seems to me that they are largely known for the improvisational nature of their performances, but I enjoyed the written material just as much. Fela’s music is, in its own way, a perfect example of the approach that I frequently talk about achieving: a unique synthesis of all of his influences into an individual sound. Throughout his discography you hear how he incorporated West African Highlife, Jazz, and Soul in the style James Brown in a way that allows them all to work together. The political nature of his music and how fearless he was in declaring his views is also an important part of who he was, and how the music sounded. Polyrhythmics have never claimed to be an Afrobeat band, or tried to accurately and faithfully execute Afrobeat music as Fela and others played it, but the influence is definitely there, and it would be irresponsible to ignore or downplay that. I’ve thought a lot recently about my responsibility as a musician to not only acknowledge influences but to bring them to the front of conversation when talking to listeners or students about my playing, especially if they are not familiar with those earlier bands and musicians. I haven’t done a great job with that, and hope to do better. I’ve made a playlist on my YouTube channel with some of the short video clips I managed to take while in New Orleans. They are very short, but it hopefully will give you at least small idea of the energy behind these live performances and the music happening here. Go here and check out the New Orleans 2015 playlist for a tiny taste of Jazzfest! In addition, there is a clip there of me from our performance at the Blue Nile, in the French Quarter district of New Orleans. In addition to what I’ve said in the past about the high number of talented musicians in New Orleans and the supportive culture in the city surrounding live music, one of the other parts of the JazzFest experience I enjoy is meeting and talking to touring bands and musicians that are at the festivities for the same reasons we are, and sometimes these bands and musicians travel just as far. It’s interesting to get their take on traveling and playing this kind of creative groove music. In general, there seemed to be those people that were part of the core groups of bands, kind of like we are in Polyrhythmics, and then those independent musicians that get hired to play in this or that group or band. These are the people that I found myself asking “who are you playing with this year?” because they may be in a different horn section or featured with a different group, etc. 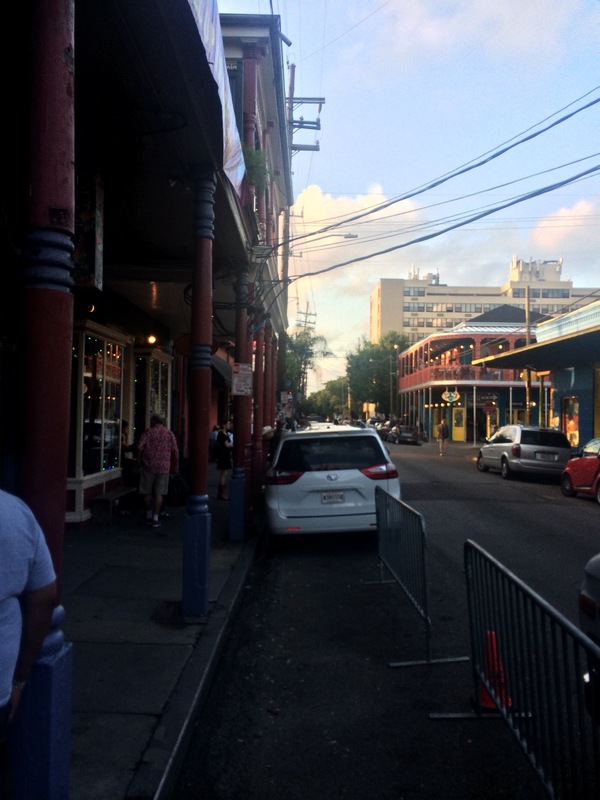 Frenchman Street, where many of the live music clubs are all lined up. This is definitely the street where I spent most of my time. 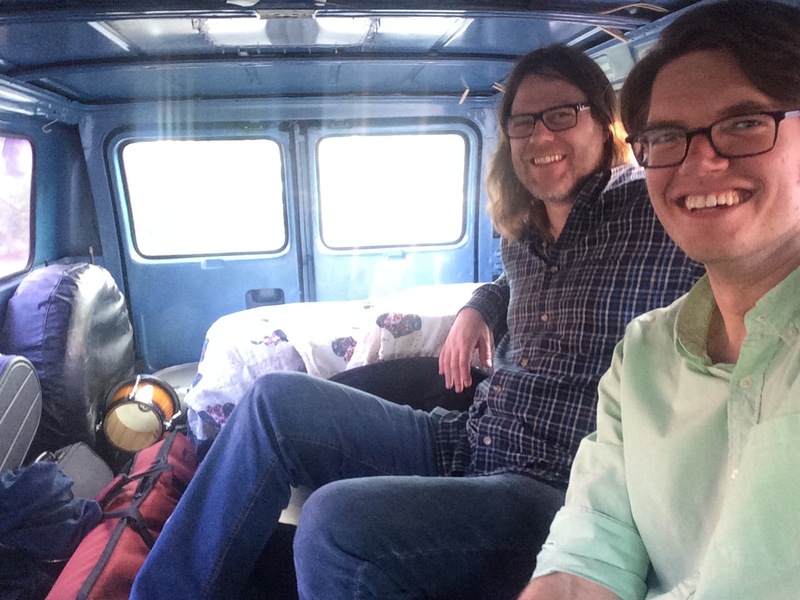 The third photo is our keyboard player Nate and I riding in our friends’ van to get to one of the gigs. 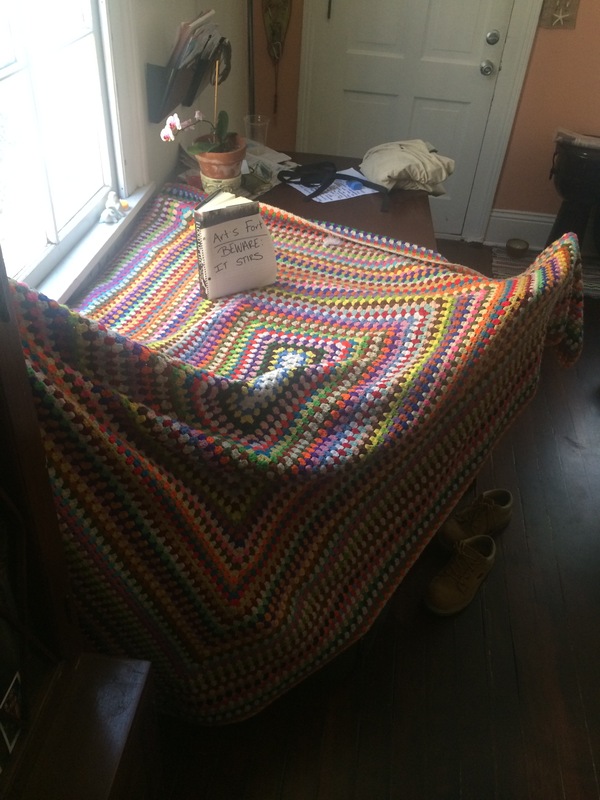 We had to borrow some drums so Nate and I made sure it got there. Don’t worry, it had seatbelts! I was going to add a photo of the Alligator sausage I had, but it tasted better than it looks, you’ll just have to trust me! Lots of exciting stuff happening. 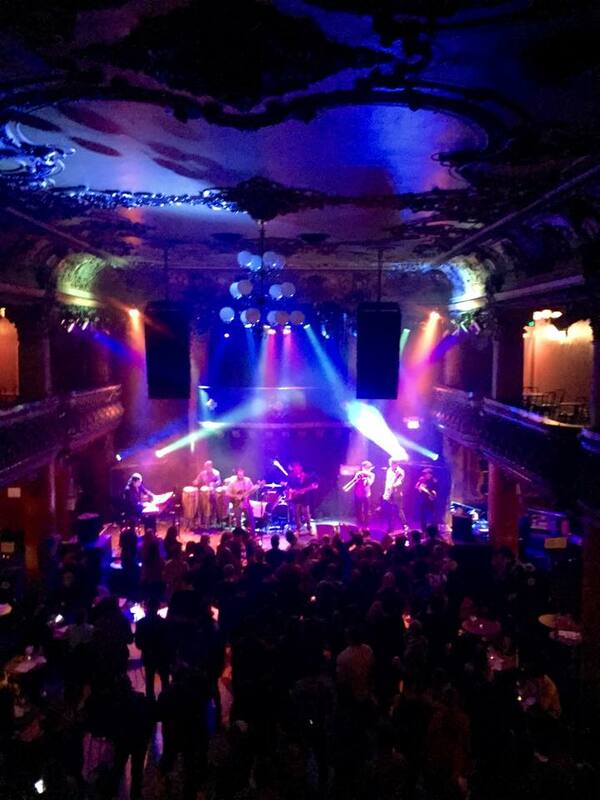 Polyrhythmics just returned from 4-day west coast tour that culminated in a show at the Great American Music Hall in San Francisco, CA. The Hall has been the site of many amazing concerts over the years, and is a beautiful room to play in. I felt very lucky to play there! The Polys will be going down to New Orleans for JazzFest once more at the end of this month, another place that seems like a blessing for me to visit. I look forward to taking in as much music as I can and getting input and advice from other musicians. Theoretics are gearing up for several festivals this Summer, which is very exciting since the band is, to me, still pretty young, at least with its current sound, and I think there are a lot of new listeners out there that will really appreciate what we do. Our Seattle show at the Tractor Tavern went very well, and we will be opening up for Robert Glasper on April 14 at Neumos. I have enjoyed Glasper’s music for a while now (here’s an older post about him here ), so this is a great opportunity to maybe get a little closer experience! P.S. Check out The Main Squeeze. This is the band we shared the stage with in San Francisco. Great stuff! The Polyrhythmics are currently on our way out of Louisiana, heading toward Colorado. The Mardi Gras celebration in New Orleans was more colorful and vibrant than I could have imagined, and although the multiple parades and costume balls range from neighbor and family friendly to parties that were for older folks, the one thing that was everywhere was MUSIC! Just as it was last year after our trip to NOLA during JazzFest, I was sad to leave the city. I love being a part of the music community in Seattle, and I never want to leave it, but it always feels special to be in New Orleans, and I think it’s a city I want to continue to visit throughout my life. Tim Kennedy Quintet at Tula’s – Tim’s original material allows all of us to interact and make great music together. We’re moving on to Wyoming and Idaho from here, then we head home to Seattle. See you all soon! When I left off, we were heading to Texas, a state I had never visited before, pretty exciting! It was an early departure from Santa Fe, and it was going to be a long day of driving, but luckily there was no gig we had to get to, just a hotel room waiting at the end. Ben and Nathan took the lion’s share of the drive. 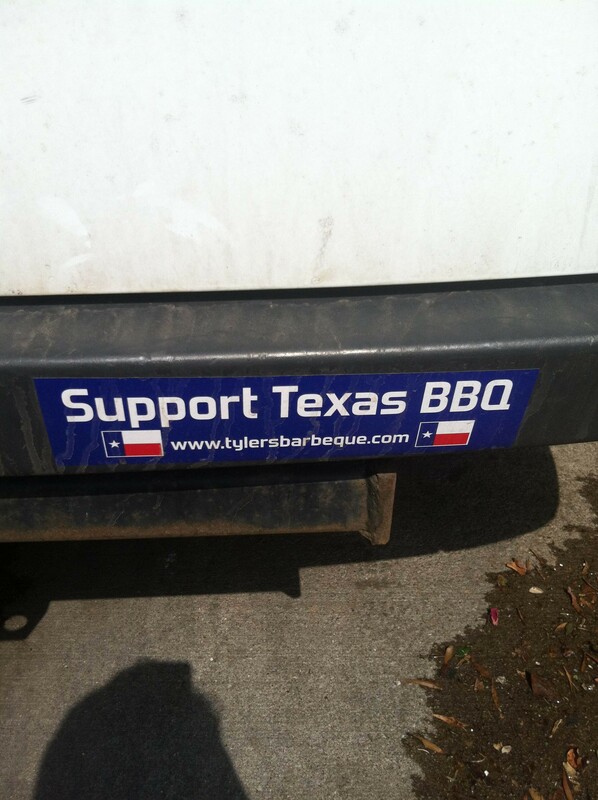 High priority for everyone was to get some real Texas barbecue at some point, which we did in Amarillo, at Tyler’s Barbeque. The owner talked to us for a while – apparently they get bands in there fairly frequently – and he was really hospitable and nice. He told us about Texas and we told him about the Northwest, which he’s visited once or twice, and he asked us about touring and the van we use, among other things. It was a great first Texas experience for me! The weather took a pretty nasty turn during Nathan’s part of the drive, although I was asleep for most of it. Some of the darkest stormclouds anyone had seen before rolled in and there were heavy rains for a couple of hours. But we made it through and Nate kept chugging until we got to Dallas to stop for dinner. From there it was an hour and a half to our hotel in Houston. The next day we were playing at Plonk Wine Bistro, and we weren’t really sure what to expect. From what we gathered, it wasn’t a traditional music venue; the owner would pay for an outdoor live music event 3 or 4 times a year as a kind of celebration for his regular patrons and friends. Because of this, and the fact that we had never played in town before, we didn’t know if anyone showed up. As it turns out, people did show, and they were really enthusiastic! There was a fair amount of New Orleans transplants there too; it appears as though they’ve built their own live music community there in Houston, pretty cool! The next morning was a somewhat early one so that we could make it on time to our load in at the Austin venue, Speakeasy. My friend Lindsay had been in Dallas visiting family, and she made the trip down to Austin to come to the show, which was very awesome of her! I had a delicious gourmet hot dog at a stylish hot dog shop/coffee shop/bar (seriously) and then met Lindsay at Fado, just like Seattle. She showed me around town a little bit, although not as much as I would have liked but time was a little limited. One of the bars we stopped at had Western dancing lessons in the evening and then a dance band at night that you could try your moves out with, which seemed pretty fun, and Stubb’s barbecue was served outside. This was a big deal for me because I only knew of Stubb’s from the barbecue sauce that’s sold in grocery stores in Seattle; to be somewhere where the real deal was cooked was a neat experience! Of course, the night was warm, so there were bike cabs everywhere, moreso than in Seattle, so that was a little different scene too. The actual performance at Austin went okay; the conclusion we came to was that the venue just wasn’t a good fit for us. There was a comedy show in the front room while we were in the back, and anyone coming in had to pay cover for both, not a great business strategy. Oh well. I’m excited to go back to Austin someday, as I enjoyed the people and the city seemed really hip! Also, big shout out to Amy for a nice stay at an apartment that belonged to friends of hers, beautiful river-view and enough room for 9, what a blessing! OKAY…next up: New Orleans. I’ve already talked off many of your ears about NOLA if I’ve seen you recently, but it’s already been a month since the trip (geez, time is moving quickly these days), so I think it will be good for me to reiterate a lot of my thoughts on the blog, hopefully you enjoy it. It’s less than a week now from when I will be on the longest tour I’ve ever done, three and a half weeks to New Orleans with the Polyrhythmics, and I haven’t done a tour blog since the first tour of my career, when Hardcoretet went down the coast to Los Angeles 5 years ago! 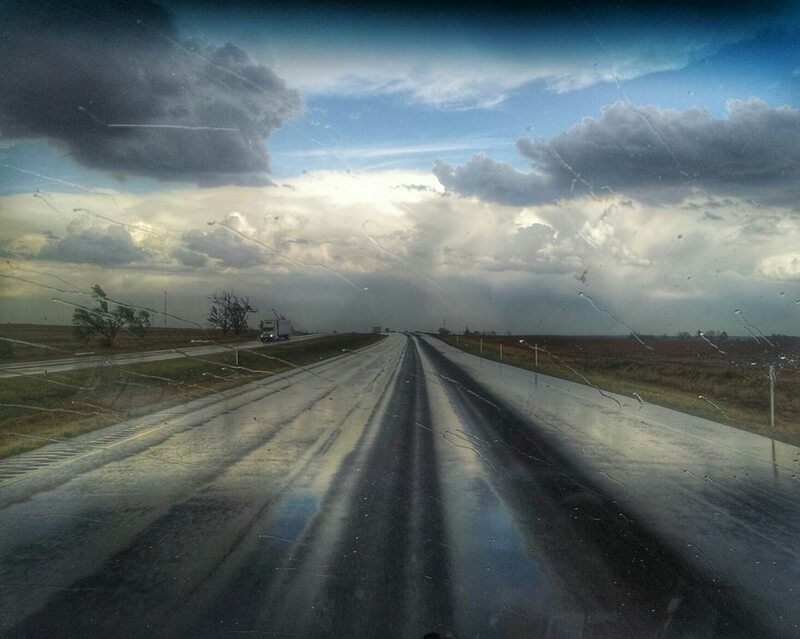 Stay tuned for posts from the road throughout April, and hopefully I will be able to put up a video or two as well.